In order to achieve the perfect swing racket needs to be properly balanced, so it would enhance player’s strengths and slightly correct mistakes. China Tungsten can provide tungsten alloy for tennis racket balance weights to improve player’s performance. Tungsten alloy is a perfect material for this purpose, because tungsten alloy allows balancing without changing racket’s geometry. Snap-on weights can be easily attached or removed so you will be able to try different configurations in search of your perfect swing. All players have different swings and control of the racket although the swing fundamentals are the same. The intent is to make as square an impact with the ball as possible with the ball landing as close as possible to the center of the tennis racket head known as the "sweet spot". But, size, weight, height, strength and other physical factors cause different players to alter the fundamental swing slightly causing "miss-hits" which in turn cause errors in the flight of the ball. A miss-hit, such as contacting the ball near the frame of the racket, will cause the ball to go in the direction different from where it is intended when the player swings. The above problems can be caused by any minor defect in the players’ swing. Thus, even though the players swing appears to be fundamentally sound, even a slightly off swing can cause a miss-hit. It has been found that a player who has a swing that is close to fundamentally sound can improve their swing by slightly changing the balance of the racket head. Increased weight on certain areas of the racket head can optimize the force at which the player can hit the ball. Thus, even the best players can benefit from variations or increases of the tennis racket balance weights. When a tennis player strikes the ball, he seeks to achieve as much control as possible while maximizing force applied to the ball. This occurs when the ball is struck with a central area of the racket. No two players have identical swings and therefore two different players may swing slightly different with the same racket. Further, since the tennis racket balance weights and overall structure is fixed while it is made; the only way to achieve a different arrangement is to obtain a racket having a different weight or weight distribution. It would, however, be advantageous if weights could be easily added at selected points of the racket that would improve a players overall swing. Selected weighting could be used not only to increase the head weight for more powerful serve, but also to correct the imbalances in a swing. A small weight or weights added around the perimeter of the frame, forming the tennis racket head, can result in a swing that is normally slightly off the impact center, being now "on" improving accuracy and power that increases the speed and control of the ball. One such method of adding weight is by tape on the inside surface of the frame. However, a disadvantage of this method is that it must be done when re-stringing the racket and the weight cannot be repositioned without removing and replacing the strings. 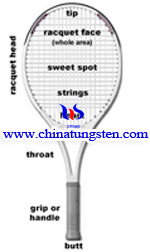 In China Tungsten, we understand your need for flexibility, therefore, our goal is to provide a snap-on tennis racket balance weights that allows you to vary the weight distribution of a tennis racket at will by conveniently attaching snap-on weighted clips to the strings or frame of the racket head at selected positions. The tungsten pellets can be provided in varying weights to allow the amount of weight added to a particular portion of a tennis racket balance weights to be varied. A snap-on weight has a weight holding crown with slots at either end of an oblong portion terminating in bores that are approximately equal to the diameter to of strings of most tennis rackets. The length of the crown is slightly longer that the space between adjacent strings. The weight holder has short centrally located sleeve providing a cup or socket for receiving a weight such as tungsten pellet. The weights can be small tungsten pellets that are pushed into the socket and firmly held in place by nibs on the weight or by closing the pocket with a covering portion. Attached to the tennis racket balance weights by fitting an adjacent string into the slots on either side of the crown until the strings engage the bores and are locked on them. The weight can then be slid down on the strings until the small sleeve having the weighted socket is firmly abutting the inside surface of the frame forming the tennis racket head. The weight holder is made of a soft resilient synthetic or rubber like material. The amount of tennis racket balance weights can be varied by adding the weighted holder at various positions around the periphery of the frame securely attached to the tennis strings. If you have any inquiry about tungsten alloy for tennis racket balance weights, please do not hesitate to contact us: sales@chinatungsten.com, sales@xiamentungsten.com. Price will be offered based on size, density, quantity, hardness, and any other specific requirements.